It may seem early to be thinking about how you are going to use your Thanksgiving leftovers since you probably haven’t even bought your turkey yet. But the best way to make sure that your leftovers don’t get pushed to the back of the refrigerator is to have a plan for how you are going to use them up. On Thanksgiving night, I clean the meat off the turkey and place the turkey bones in the slow cooker to make turkey broth. The next morning I wake up to delicious turkey broth and have the base for several delicious recipes. The best way to ensure your family doesn’t get tired of leftovers is to create new and surprising flavor combinations with your leftovers. If you just reheat turkey and mashed potatoes they will probably get bored, but if you use the mashed potatoes in a Pierogi Casserole and the turkey in Curried Turkey Salad or Lasagna Soup they will probably forget that they are eating leftovers. Add olive oil, onion, garlic, carrots and celery to a large pot. Saute on medium-high heat for 5 -6 minutes or until onions begin to become translucent. Add tomatoes, tomato sauce, broth, and spices and bring to a boil. Add noodles and simmer until al dente, approximately 10 minutes. Add turkey and spinach and cook until spinach is wilted. 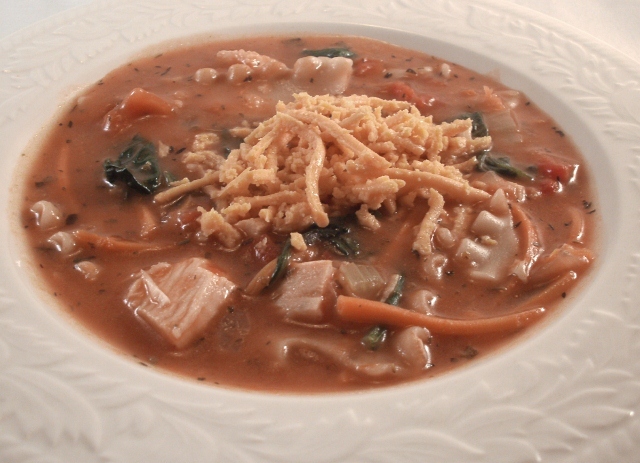 Top each bowl of soup with 2 tablespoons of cheese. 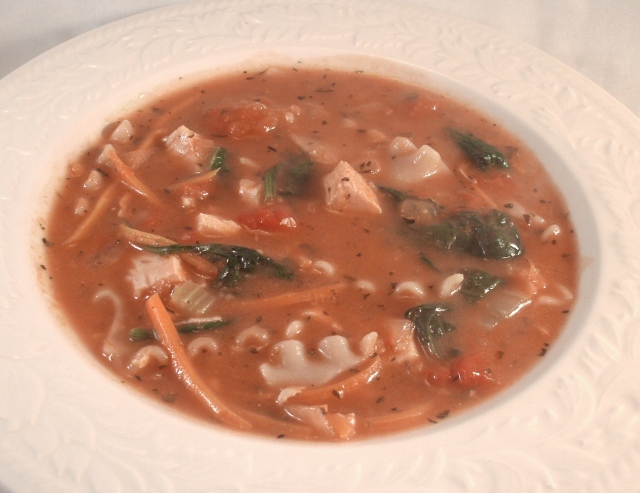 I serve this soup with a garden salad and rolls if we have any leftover from Thanksgiving dinner. There’s some fantastic ideas in this post (I love the idea of making the turkey stock in the slow cooker overnight) and this soup sounds scrumptious. I may even use some leftover chicken I have in the freezer just so I can try it sooner!